Our Model finds a cohort of comparable companies with similar business fundamentals to the target company in a large N-dimensional feature space of fundamental features. We then run a Relative Value Model tailored to the characteristics of each cohort to come up with Fair Value Metrics for each company. Over 2500+ companies supported! Looking for a tool to help you with your technical analysis? We have trained our Deep Neural Network (DNN) to find Bullish/Bearish patterns based on 20 years of price action and volume data from 1996 to 2016 over hundreds of stocks. Harness the power of our DNN to help you find patterns in the price movement! Looking for your next investment idea? You've come to the right place! Hone in on your investment picks using our daily updated selection of stocks from top dividend paying companies to hyper growth companies to short picks as well. Want to customize your search? Our stock screener allows you to filter 4500+ US equities on 50+ fundamental fields. We will also show you the recommendations from our Fair Value and Momentum Models where available. Try it out with our one week free trial! Sign up for our free trial! No Credit Card Needed! Or sign in with your Google or Facebook account. If your want to continue your subscription after the free trial expires, input your payment details and subscribe monthly or yearly for $14.99/Month or $119.99/Year. Humans are biased. We are also bad at comparing entities when given more than 2-3 features. Machine Learning solves this. 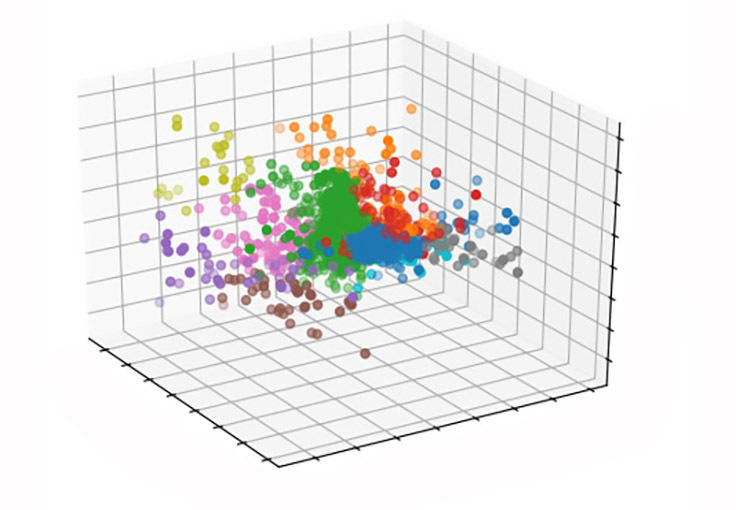 We find a cohort of comparables closest to the target company in a large N-dimensional space of Fundamental Features. Fair Value levels are then computed using Relative Value Models tailored to the unique characteristics of each cohort. Looking for patterns in price action and volume data? Why not harness the power of today's state of the art systems. We have trained our Deep Neural Network (DNN) to find Bullish/Bearish patterns based on 20 years of price action and volume data from 1996 to 2016 over hundreds of stocks. 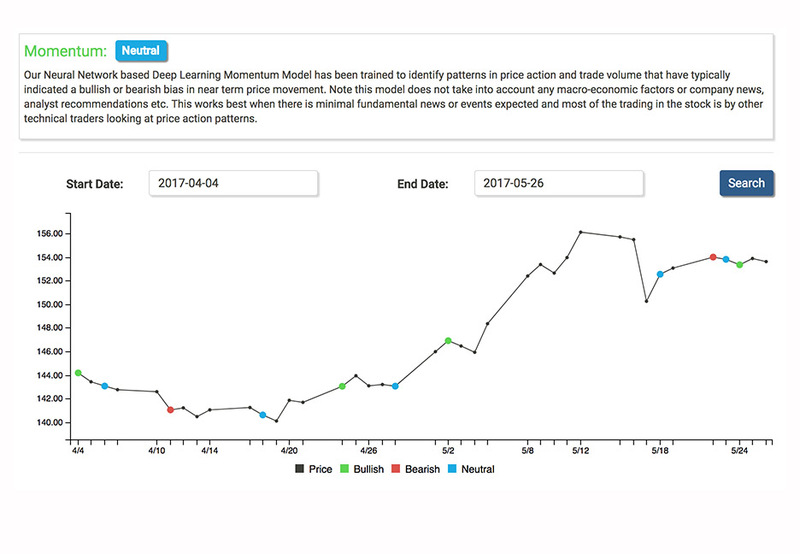 Our cohorting, Relative Value and Momentum Models are refreshed daily to incorporate the most up to date information. Want easy access to our model results on your favourite stocks? Add them to your watchlist and subscribe to our daily email. Want to come up with your own relative value model? Select your comparable companies, valuation metrics and aggregation method and compare your fair value levels to our models. Choose from our daily top picks across dividend payers, value plays, growth stocks and even short opportunities. 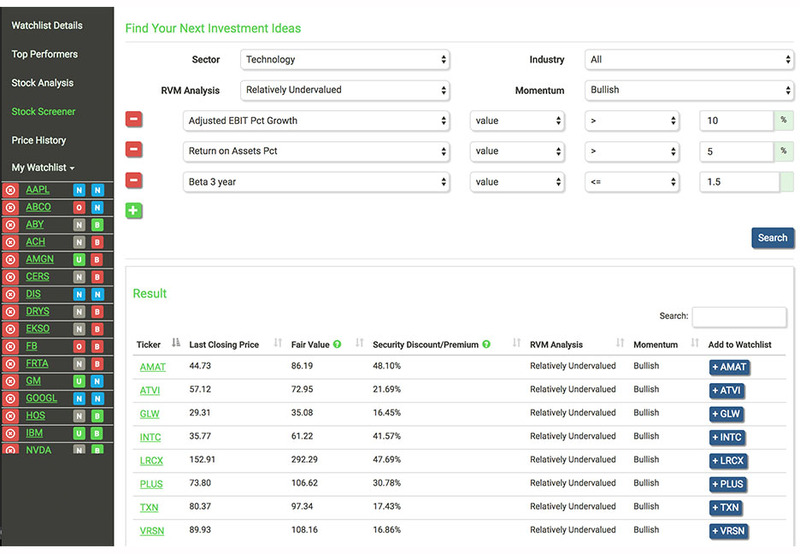 Want to find your next investment idea? 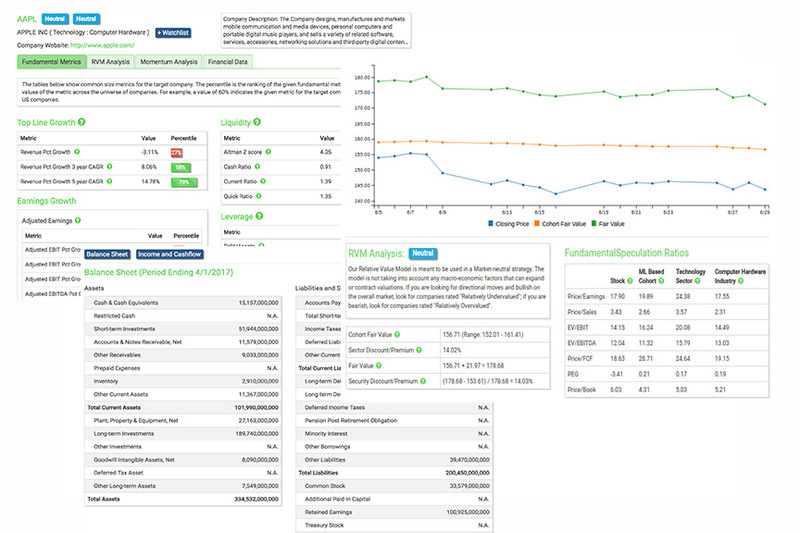 Our Stock Screener allows you to filter companies using 50+ fundamental metrics. Over 4500+ US companies supported. We provide 50 common-size fundamental metrics and Balance Sheet, Income and Cashflow information as of the current reporting period on over 4500+ US companies. We understand that most people have relatively small portfolios and do not trade as often. That makes it hard to justify subscribing to a service costing tens or hundreds of dollars a month. We provide you access to cutting edge financial models driven by industry leading data providers for $14.99/Month or $119.99/Year. Don't have the patience to enter all the details typical websites ask you to fill in to register? We have you covered! Just use your Google account to signin. One-click and you are in! "Our goal is not to give you daily buy or sell recommendations, but instead to provide you with a meaningful, trustworthy and unbiased tool that you can use to make educated investment decisions."